Meditation is something I’ve always been interested in but always struggled to commit to. I guess I just didn’t know how to meditate. I felt that I was doing it wrong by feeling distracted and having thoughts through times of meditation. Recently I made the decision to commit to meditation and set a goal for at least 5 minutes a day. I had heard of the app Insight Timer so decided to give it a go. Use guided meditation to learn the basics Insight Timer This is a free app with thousands of free meditations. As soon as I joined I was offered a 7 day challenge which I completed. It was great to learn the basics. It covered breathing, emotions, intentions and even mantra which I hadn’t tried before. I surprisingly really enjoyed the mantra. It was always one I wasn’t keen on as it occasionally requires saying a statement out loud. This one was no different, in fact I don’t even know what the statement meant but the host said this isn’t a problem. I found that I enjoyed this more than a simple breathing meditation and that having the mantra to repeat kept me focused and I had less thoughts come up throughout the meditation. I really enjoyed it and highly recommend it. You have access to so many topics and areas of meditation. You can pick the length of time you have free and it only shows you that length. It’s really flexible and there’s so much choice. I also love that it tracks your days of use. I love this to keep me motivated to use it daily as I love to build up a big streak. I remember one of the first guided meditations I had was when I had an awful cold. I remember thinking everyone goes on about the benefits of meditation let’s see if it will make me better. I searched “guided meditation to relieve a cold” I listened to the first one that came up and by the end of the meditation my cold symptoms had reduced considerably. You can search for any topic on YouTube and find a guided meditation. They are also really useful for positivity, gratitude, confidence, stress and much more. Search on YouTube for a topic you’d like to work on and share your favourite meditation in the Facebook community. Mindful In Minutes – has many topics including self-love, anxiety, stress, fear and body acceptance. The guided meditations are around 15 minutes long. One Mind Dharma – very similar and has a range of topics including compassion, calming and concentration. The guided meditations are about 20 minuets in length. Tracks To Relax – this is my best friend when I’ve got so much excitement and ideas in my head and can’t sleep. They are around 20 minutes in length and I rarely hear the end. I always have a restful night sleep and wake up feeling relaxed. They have a positive wealth affirmations and dreams of flying sleep meditation. Find a quiet place with no distractions. Sit comfortably with a straight back. Close your eyes. Begin by focusing on your breath – feel the sensations in your body as you breath. Take a deep breath in through your nose and feel your lungs fill up. Then slowly breath out through your mouth. Repeat this until you are feeling relaxed. You can try experimenting with affirmations or a mantra. You could say “I am still” “I am at peace” “I am calm” “I am relaxed” or something along those lines. Allow any thoughts to come and go. Try not to get frustrated when thoughts arise. Don’t pay any attention to them just allow them to be there then disappear when they do. How did you find that? Is meditation something you want to work on or is it already a solid part of your routine? 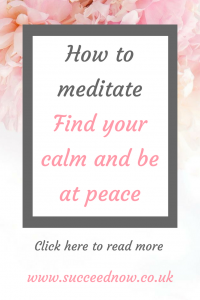 I hope this has helped you understand how to meditate and I’d love to hear your meditation story over in the Facebook Group. I am trying meditation now so this post came at the right time. I like the different options you give to get started with meditation. Thank you for the post! I see the benefits of meditating, since I’ve started doing so each morning! I love the breathing exercises too. Oooh! This sounds good! I’ve used Headspace before and loved that but my kids kept interrupting me. Perhaps I should try it again.